The GEMCO® 958 Series Compact Housing Linear Displacement Transducer (LDT) was developed to meet the most demanding processing challenges found in the Industrial and Mobile hydraulics industries, regardless of application or operating environment. The 958A is a rugged, accurate, programmable zero and span, auto-tuning, non-contact linear displacement transducer in a compact housing rod-style package. The Compact Housing is less than 1.2" in depth, which allows the unit to be installed in applications where traditional Rod Style transducers will not fit, or in applications where customers are looking to simplify installation and serviceability of the sensor. 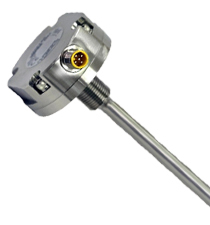 The transducer is made entirely from Stainless Steel and utilizes our field-proven Magnetostrictive technology to give absolute analog position feedback, accurate to 0.04% of the programmable sensing distance. A variety of different analog outputs with field programmable Zero & Span points are available to meet your needs. The Compact Housing LDT features our auto-tuning capability, which allows the unit to sense a magnet other than the standard ring magnet, and adjust its signal strength accordingly. Units also include a diagnostic feature that will indicate to the host controller if there is an issue with the sensor, or if the magnet has moved outside of its sensing range. • Sensor Length up to 100"